Any help would be appreciated :] I think I’ve tunneled vision on this so I can’t quite see another alternative. At the start of the loop with i = 0, you check if str[i] === reverse_str[i]. If so, true is returned. Otherwise, false is returned. Either way, you return a value at the first iteration of the loop. The loop breaks too soon, and only the first characters are compared. Instead, you want to check if str[i] is not equal to reverse_str[i]. If so, return false. The return true should be outside just after the for-loop, after you have checked each letter and are sure that all letters match. The outermost if/else are actually redundant. Protip. 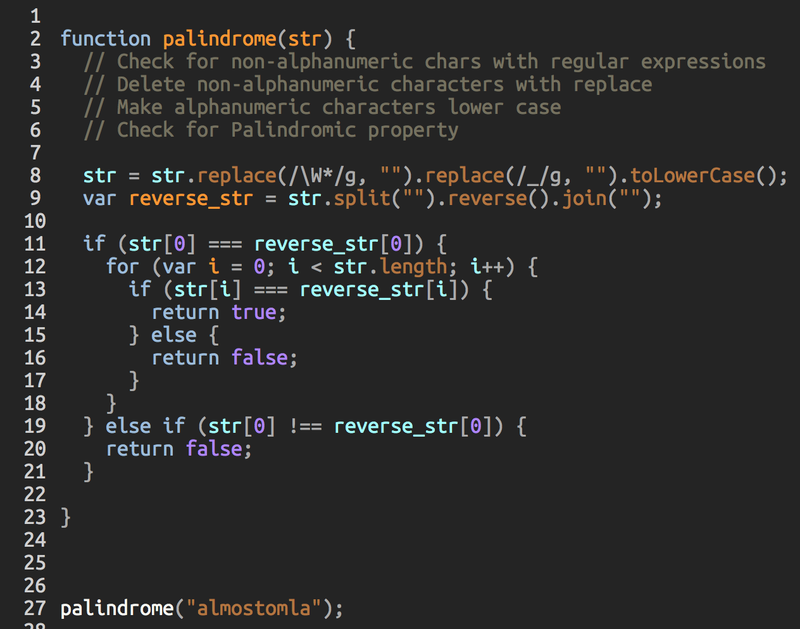 Instead of pasting a screenshot of the code, paste the code itself. It’s easier for others to copy/paste code to a code editor than to type the code right out of your screenshot. Thanks kev! Is there way to indent here in the forums? I didn’t copy/paste because the code looked messy without indents.